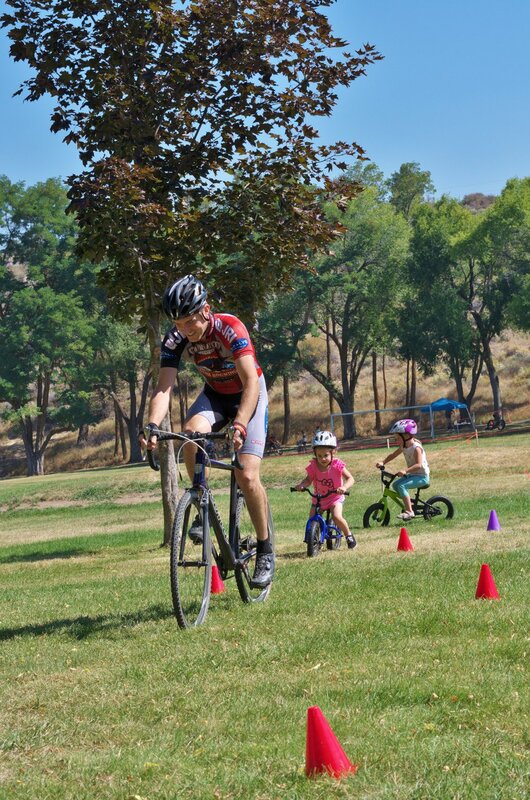 Now in the 9th year, Lilly and myself have organized Klamath Falls first and only cyclocross race. When we started this event, we wanted to bring this niche sport to Klamath Falls for many reasons: it's an incredibly fun spectator event, it's comparatively more accessible to try than other bike racing, and it's relatively easy to put on. The sport of cyclocross has been going on in a seemingly underground fashion almost since the beginning of bike racing. When you say "cyclocross," many people return a complacent, yet vacant, acknowledgement of what it is. They don't want to admit ignorance: the term seems somewhat recognizable, almost as if they should know it already. Instead it's easier to let the conversation draw out and induce the meaning of the term by context. But the sheer nature of the sport betrays that approach. To describe this sport in even a few short sentences does it injustice and will mislead, even with the most descriptive summary. To really understand it, you need to be involved: jump in to the race with no expectations. You really don't need any special equipment or training for cyclocross. It certainly helps, but it's definitely not necessary. A basic hybrid bike, a better than sedentary level of fitness and a good attitude is really all that's needed to get started. Nobody really takes takes themselves too seriously. The ones that look like they do will typically retain a generous sense of humility. In the end, no matter what happens, you can say you at least had a bike ride in the park. Most people don't really have a good reason to skip this event. When I said it was relatively easy to put on, I'd like to emphasize the relative part. It's easy in that we don't need to sign a 30 mile singletrack course. We don't need to arrange follow and chase cars. We don't need an army of volunteers manning water stations. It's actually a ton of work to put this event on. We rely on volunteers heavily still: there's no way we could accomplish this without help. I normally start my day out there at 4:00 am, and don't leave the park until around 5:00 pm. I spend a couple of hours staking the course the night before, and a couple of hours untangling old course tape (we've diligently re-used the course tape every year, some of that tape is nearly a decade old now). But in the end, it's worth it in many ways. We have enjoyed many benefits from this event. First and foremost being the ability to share one of our passions with the community. We tirelessly keep an event going on in a place where people complain about nothing ever happening in. We get to show off Klamath Falls most beautiful park in such an amazing time of year. We raise money for a foundation tasked with the betterment of said park. I'm simultaneously surprised and proud that we have stuck with it for almost ten years. But as with anything that is difficult to do, the farther you are away from it in time, the easier it is to look back and see the good stuff while forgetting about the hard.